Our newest project! 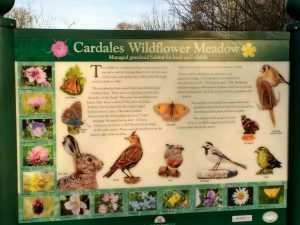 Cardales Meadow can be found down Commonpiece Lane, Findern. It is adjacent to Crow Park Way (footpath 11). This field was purchased by the Highways Agency when the A50 trunk road was built in 1996. Now surplus to requirements, it is leased to us for this conservation project. With help from Findern Historical Society, we discovered that the old field name for this site is Cardales Close. ‘Close’ means a small enclosure. 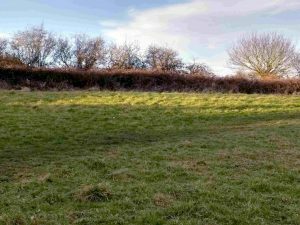 We have sown a traditional wildflower meadow on the site, and intend to manage it by a programme of structured mowing in the traditional manner. This project is vital as it is estimated that 91% of species-rich natural grassland has been lost in Derbyshire between 1984 and 1999. It will promote diversity as we do not have this habitat here in Findern, and it will complement existing woodland, hedgerow and wetland sites. We have already recorded several priority species on the site, brown hares, grey partridges, skylarks, pipistrelle bats, kestrels and lapwings and are hoping that it will attract further priority species of mammals, butterflies, plants and birds. 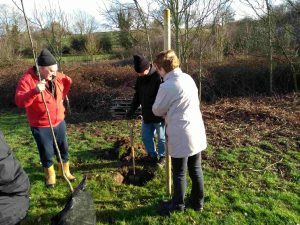 The project was planned in conjunction with Derbyshire Biodiversity Project Officer and Derbyshire Countryside Service. A local farmer ploughed a test strip of ground for us. We sowed five different seed mixes, foundation meadow mix, herb mix, spring meadow mix, foundation + meadow mix and summer meadow mix on the site. After determining which was the most successful, the meadow was sown in Autumn 2008. 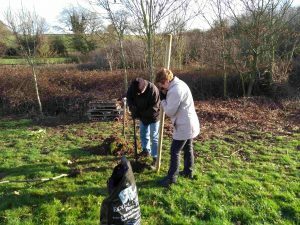 We also planted wildflower plugs, which were donated by Warburtons. We are grateful to the Naturesave Trust, who have funded the installation of access gates to allow easier access for the less mobile. We have installed an information board which will inform people about the wildlife on the site. This site is managed in the traditional manner. Hay is harvested and removed from the site in late summer. 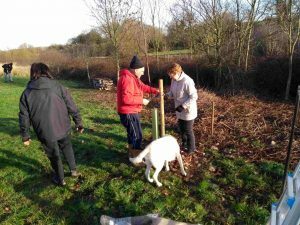 The pictures below show Kath and Barry and members of the Footpaths Group planting in the meadow.